Microsoft's restructuring places a new emphasis not on products, but on technologies that will be shared across the company, to tie together and improve the company's overall business as a whole. What does this mean for consumers? For us, it most likely means a sense of coherence: Not only will Windows Phone and Windows 8 look like one another, but it could mean more shared code and services, for example. So how will it work? Microsoft CEO Steve Ballmer published both a lengthy memo as well as a strategy document unveiling the changes that the company outlined Thursday. Simply put, all parts of the company will share and contribute to the success of Microsoft's core offerings: Windows, Windows Phone, Xbox, Surface, Office 365, Bing, Skype, Dynamics, Azure and Microsoft's server products, Ballmer wrote. "We will see our product line holistically, not as a set of islands." 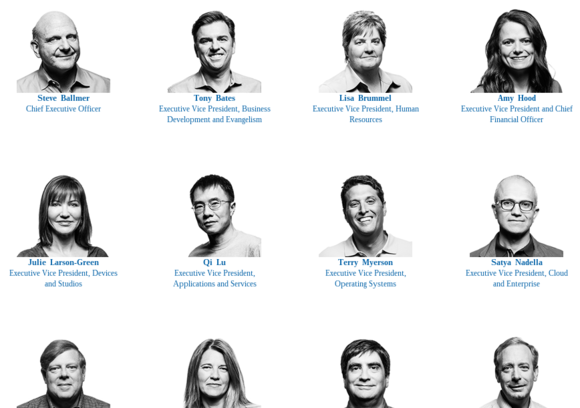 A few of the faces that will be overseeing Microsoft's new business units. Business strategists will undoubtedly spend days parsing Microsoft's business strategy, but on the surface, there are a couple of key changes. First, Microsoft's priority is engineering technologies, not products, and its core leadership all share "engineering" titles. Second, the devices that you buy, such as tablets and phones, will simply serve as gateways to the Microsoft software and services that you already know and use. The difference here, however, is that the ecosystem will be more tightly interlaced, as evidenced by products like the Xbox One, which will include Skype and Internet Explorer. "We will consolidate our technologies coherently into these groups pulling together some things that have been spread out in our current BG structure like cloud infrastructure, operating systems, mail, and identity, to name a few," Ballmer wrote. "Some of these changes will involve putting things together and others will involve repartitioning the work, but in all instances we will be more coherent for our users and developers." Ballmer used terms like "nimble," "collaborative," and "decisive" to describe Microsoft's new business, underlining its commitment to updating its software more frequently. 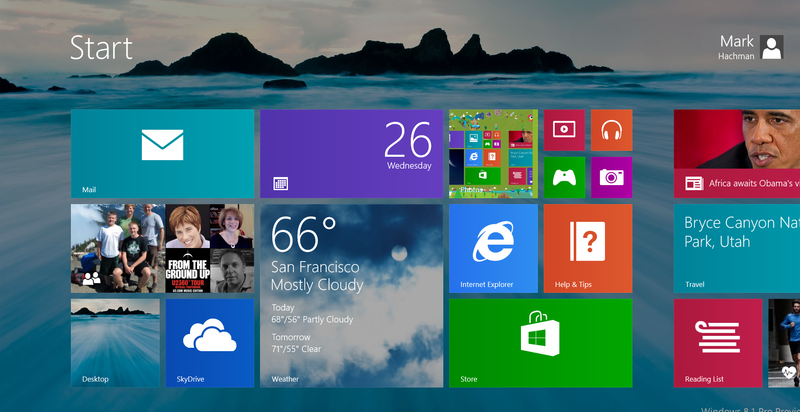 Patrick Moorhead, principal at Moor Insights, says consumers should expect Microsoft to push synergies. "Holistic 'solutions' like the interaction between phone, tablet, PC and Xbox will trump individual products in the future with Microsoft," he said. "I believe that within engineering/product groups, the reorg has the possibility to speed up execution and decision making," Moorhead added. "To accomplish this, Microsoft decided to pull everything together, particularly across products." Here's the way Microsoft now thinks of its business: as a company providing operating systems, apps, the cloud, and devices. Let's look at each one, briefly. As Ballmer noted, Terry Myerson will run the OS Group, and it will "span all our OS work for console, to mobile device, to PC, to back-end systems," Ballmer wrote, including the "core cloud services for the operating system." That last bit could be interpreted as something akin to SkyDrive, or it could be indicative of a more profound change, such as an incredibly thin, connected OS that loads up modules from the Internet as needed onto devices with limited hardware resources. A cohesive OS strategy will also undoubtedly result in closer ties among Windows, Windows Phone, and the Xbox, with extremely positive implications for apps and user interfaces. This is more of a puzzler. Julie Larson-Green will oversee all hardware development and supply chain operations (think component purchasing) for all Microsoft devices, like the Surface and Xbox. But she'll also have control of all of Microsoft's "studios" experiences, such as its game development, music, video, and entertainment. Not to slight Larson-Green, but this seems to put a lot on her plate. Games go hand-in-hand with the Xbox, true, but breaking out a Devices Engineering Group for Microsoft hardware and a Studios Engineering Group fror creative work seems like a more natural division of labor. Perhaps we'll see this group fracture if Microsoft's investments in either increase. Qi Lu who ran Microsoft's money-losing Online Services division where Bing resided, will now stash Bing inside a business that will presumably include Microsoft Office, a traditional money-maker for Microsoft. Lu will be responsible for "core technologies in productivity, communication, search and other information categories," code for Office, Skype, and Bing. One question is who will be responsible for traditional Windows 8 and Windows Phone apps like Mail or People; they're traditionally tied to the OS, but are also developed along their own timelines. Satya Nadella will lead development of Microsoft's back-end technologies like its datacenter, database and specific technologies for enterprise IT and development tools. He will also lead Microsoft's datacenter development, construction and operation. We can probably assume this means Nadella will continue to be responsible for Azure, and for tying it to the datacenter hardware that Microsoft uses to power its own cloud services. It's hard to believe that Nadella won't be contributing to Myerson's work, ensuring that enterprises continue to influence the direction of Windows Server. But Nadella will apparently be responsible for the back-end database stuff, which will likely include Outlook.com and possibly SkyDrive. Microsoft Dynamics will have its own group, as will the Advanced Strategy and Research Group (aka Microsoft Research). Marketing, business development and evangelism, and the backoffice functions of finance, legal and corporate, and HR, will also have their own groups. The chief operating officer, Kevin Turner, will be his own group as well. Will more collaboration mean less distinction? Placing technologies first and foremost makes sense, in a way. Microsoft's ecosystem has notoriously favored Windows, but even Windows 8 has barely cracked 100,000 apps in the Windows Store. Still, I think the question that will overshadow Microsoft in the months to come is how the company's individual product managers will operate under these new marching orders. Will this empower them to coordinate and pull from disparate groups and improve their technologies? Or will they all be plagued with a sense of sameness, and with less emphasis on polish and pleasing the user? What we do know is this: Microsoft's Turner this week promised even more innovation for Microsoft in the year ahead than what Microsoft accomplished through July. And what the company does, or does not do, during that time, will be viewed through that prism.